As in all large, too-good-to-be-true real estate locations in Park Slope, all good things come to an end, and Royal Video moved across the street to a tiny location to cater to their small but still existent clientele. Along came a large construction project in that old area that aroused “the Brooklyn crazies” and their petitions to which we owe the dulled down Woodland restaurant that was originally rumored to be a three-level gentelman’s club. Thank god for the noisemakers! 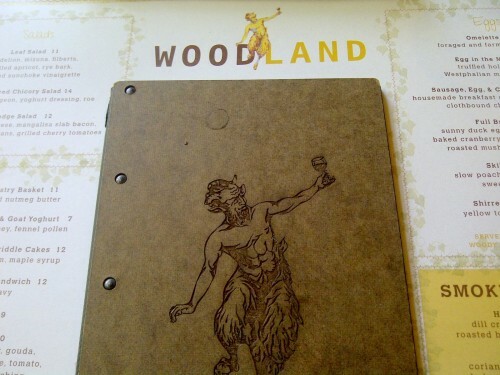 So now we have Woodland, a hip, nicely decorated corner joint that aims to please. 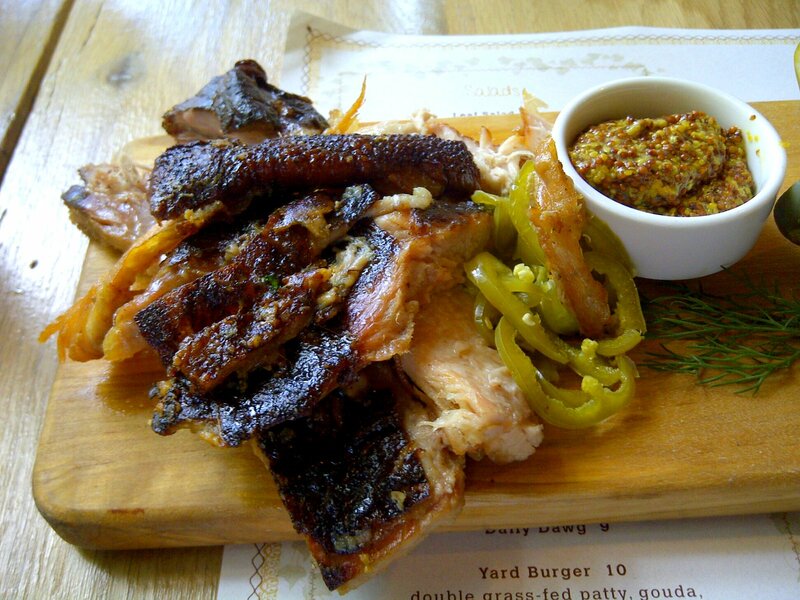 They have an in-house smoker that allows them to create such specialties as slow smoked meats and even their own smoked ketchup. Brunch includes a bloody mary or a mimosa, and they definitely do not skimp on the post-Saturday fixins of hangover specials. Love the large pickle action. 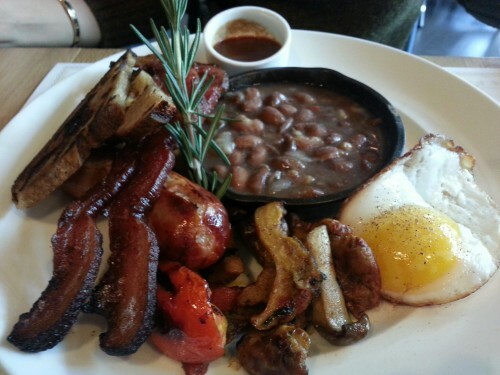 Full Brooklyn – duck egg, bangers, bacon, cranberry beans in a skillet, grilled tomato and mushroom. The Full Brooklyn does not allow shyness. Basically a smorgasbord of smoked goods, this is a meal for those in need of serious salt and grease replacement. You have been warned. 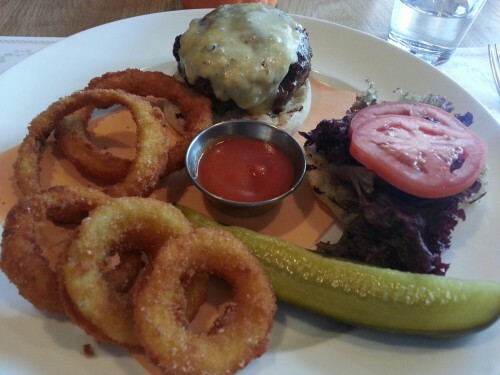 Butcher Burger – beer cheese, smoked ketchup, buttermilk onion rings. And what is a brunch place without a classic burger? The smoked ketchup is a good touch. 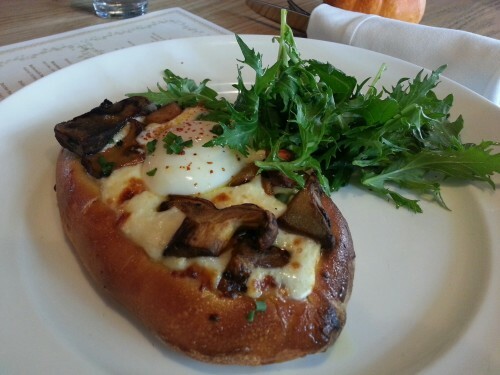 A toad in a hole is a traditional British breakfast of sausage and eggs in pudding batter, but Woodland’s is one with truffled mushrooms and farmers cheese. 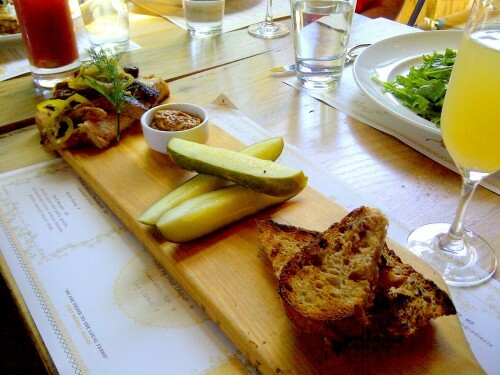 I haven’t tried dinner at Woodland but the brunch offerings are a good indication of their attention. I like their focus on smoked meats, their modern hardwood + cast iron interior that somehow reminds me of another favorite Dressler in Williamsburg. Woodland is a good addition to the neighborhood.